I have been working out 5 days a week now, since the end of my IF andcompound exercising combo. At the moment I am not doing the intermittent fasting thing, I just eat 3 main meals plus 2 snacks in between the main meals. I am also training my abs more regularly now after my workouts 4 times a week. I do not train the same abdominal region on consecutive abs days, I train upper abs, the maybe lower abs followed by oblique’s and on the 4th abs day I do a short intense routine that involves all the abs regions then the cycle starts all over again. I train abs for a short while after my workouts now and the short core workout I am sharing with you now is one that I find is effective after a workout where your core has already been trained in directly be it during leg day when you were squatting and doing those straight legged dead lifts and whatever else that needs a strong stable core. First up I will tell you that this workout involves doing slow controlled sit-ups, the plank exercise and the side plank. Plank on top, side plank at bottom. 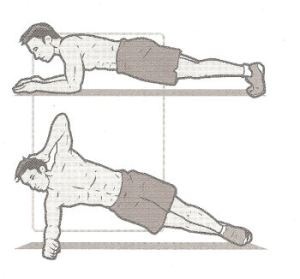 You should start with the normal plank exercise stay there for 30 seconds, then without taking a break switch to the side plank for another 30 seconds, then go back to the normal plank for 30 seconds followed by a side plank to you other side now for 30 seconds. If you are doing these properly your abs should be feeling something after those 2 minutes, repeat this 3 times and move on to the sit-ups. After you are already feeling the burn from the plank exercises do 25 reps of sit-ups where you squeeze at the top, and go back down in a slow controlled motion. Do not go to fast, you want to feel the burn, not use momentum but pure effort to do each rep. I will share more of this kind of stuff as time goes by, I want to find effective ways to thicken abs and make them more visible, working out more often (5 times a week) is just one way of doing it, working out more often means that I get to burn more calories. I will post pictures of my progress at a later stage till then be on the lookout for new updates.